One week ago today, a bunch of New Yorkers dined al fresco along the Hudson River. The sun was setting - as it so famously does - fading west across the rest of mainland America. But this sunset was particularly different than most. Édith Piaf’s melodious voice echoed across Robert F. Wagner Junior Park, amongst 5,000 new friends. All of who were dressed in white; head to toe, all out. From feathered hats that rivaled (and would most likely outdo) The Derby, down to the freshest-to-death white leather brogues, this sea of outfits was on point (on fleek… if you will). Bread had been broken, Moët was flowing, and hundreds upon hundreds were dancing to the beautiful French tunes. 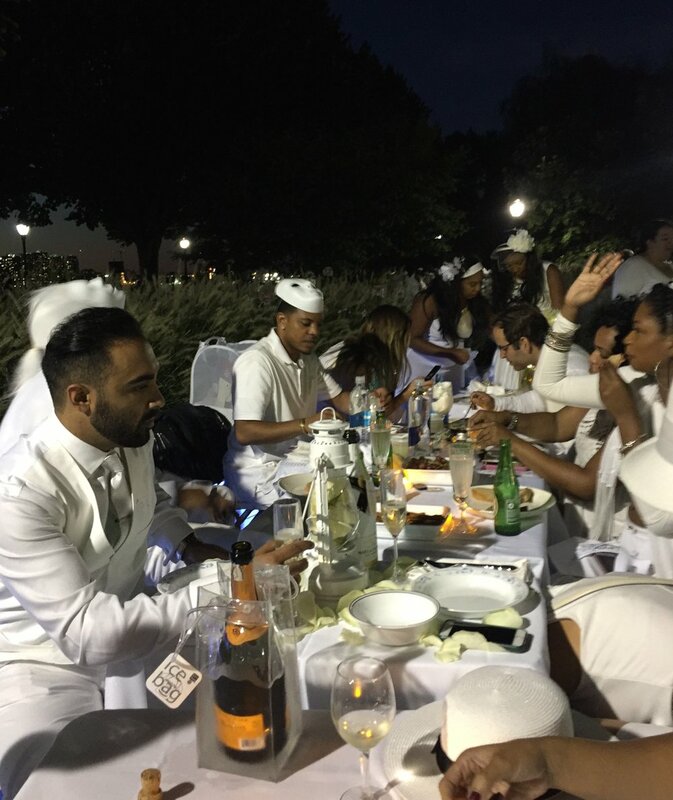 This wasn’t just a fancy picnic in the park, this was a secret pop-up supper that took every breath away; it was Le Dîner en Blanc. 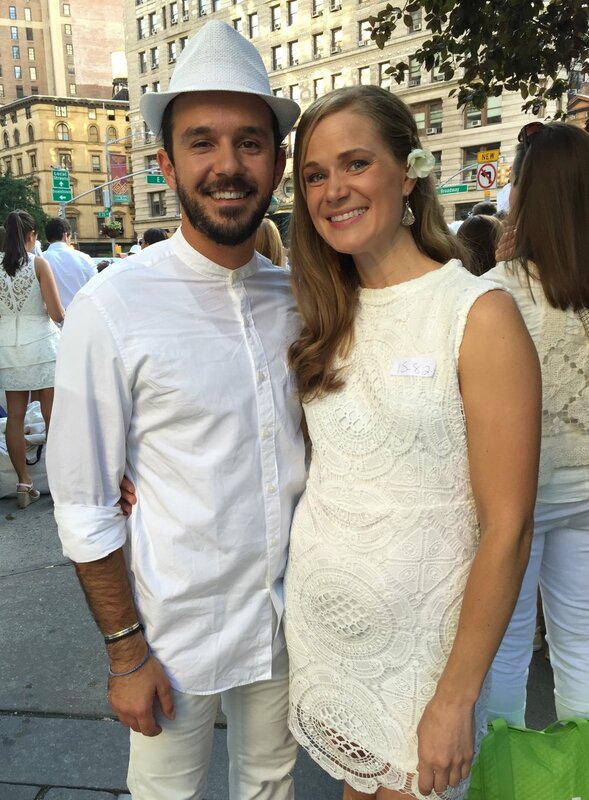 Le Dîner en Blanc is an experience like no other, and finally getting the chance to be a part of it (after three years on the waitlist) felt right. It just felt right. And it felt even “righter” when I found out that this year’s event had a waitlist of roughly 45,000! 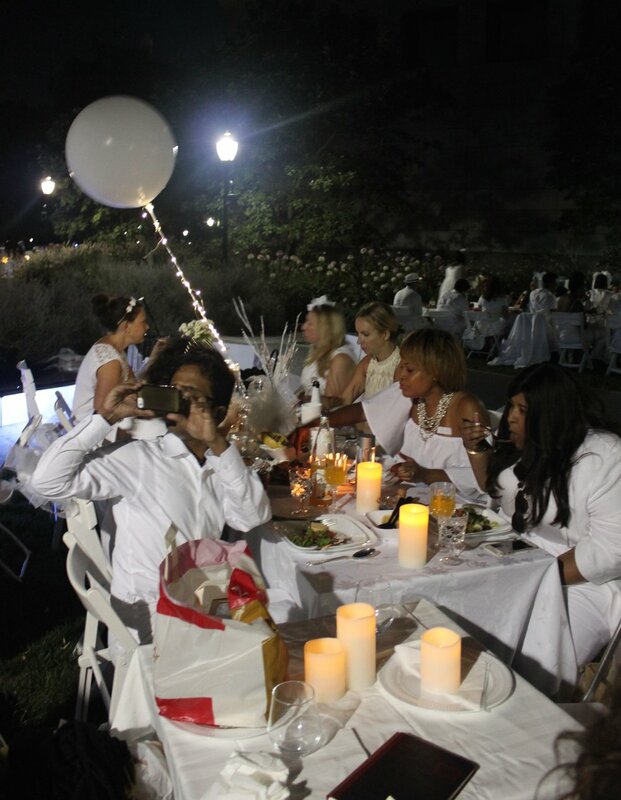 Le Dîner en Blanc started nearly 30 years ago by a group of friends in Paris, and is now celebrated in over 70 cities worldwide; from Rwanda to Japan, Argentina to Sweden, Le Dîner has truly grown into a full-blown international phenomenon! You can only wear all white (top, pants, dress, shoes, accessories, etc.). All white, no exceptions. As this emulates a picnic, you must bring something to eat, and obviously something to eat off. But wait, no blankets, fast food, or paper napkins here! You are required to pack in a three course meal (you can now purchase dinners catered directly through Le Dîner), to be served on non-disposable dishes/cutlery. And not a reusable plate from REI, we’re talking about the good stuff. Bust out the old silver set, and grab those crystal champagne flutes you’ve been yearning to use (or just dreaming about them). Plus, our own white chairs, table, and a crisp white tablecloth to boot. Nothing is pro died for you. Pack out what you brought in, so it doesn’t seem as if we were even there (bring a white garbage bag!). HAVE FUN and make as many friends as possible! But I think the best part about it all if the secrecy of it. You essentially don’t know the location until you arrive there! Of NYC’s roughly 5,000 attendees, everyone meets at different pre-assigned locations scattered across the city between 5:00 & 6:00 PM. We met at Madison Square Park, and there were about 200 of us on the corner of 23rd & Broadway. Quite the scene for those commuting to and from wherever their day’d taken them. Our larger group was getting lots of inquisitive looks. A couple hundred people, all dressed to the nines, with portable tables and chairs. Picture an impromptu wedding reception, about to setup on the sidewalk - dressed thinking like they’re all the bride. But this meeting is facilitated by a group leader and their Dîner squad of sub-leaders, who in turn led us down into the subway… On a Thursday… at 5:45 PM. If you didn’t already catch my drift, it’s rush hour - on the N train, and we quickly find out we’re heading downtown. Whispers turn to shouts, and you hear - “Take the next N train, 8 stops! EIGHT STOPS!” And that’s when we all quickly calculate we’re heading to South Ferry. Are we possibly going across to Governor’s Island? The thought crossed our mind, but orchestrating this many people onto ferries seemed a bit much. After a relatively calm commute, as our group emerged back above ground at the southern tip of Manhattan, every direction you looked was full of other groups of 200 people, all doing the same thing: walking towards the setting sun into Battery City Park. This was the slightly chaotic part; we were all trying to line up with our assigned group (who you’d just traveled with). Somehow, we all made it through, got our tables set up, and then the event ceremoniously started by having all the dining guests spin their white linen napkins over their heads in unison, hooting & hollering, commemorating the official kick-off to 2016’s dîner. It’s kind of hard to explain how much fun it all was, and how it looked, but please check-out last year’s reap video for some visuals. 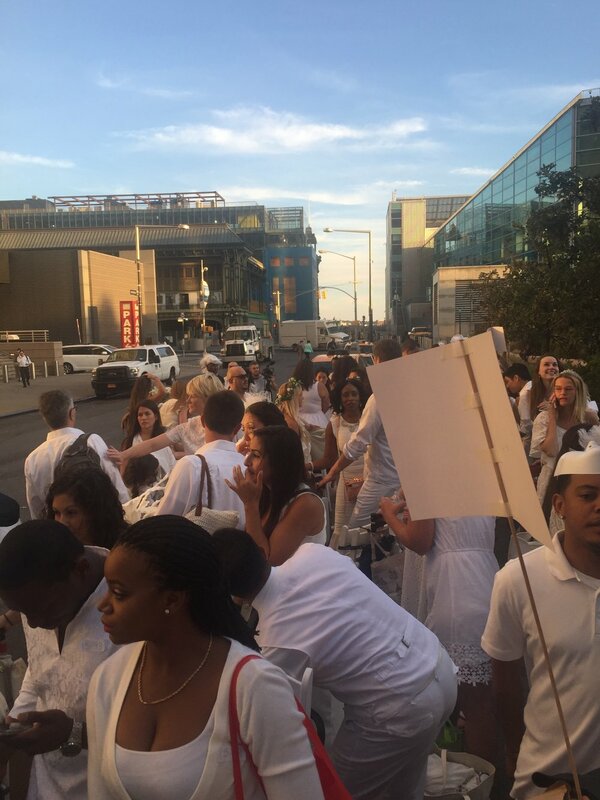 If you’re interested in learning more about the roots of the soiree, seeing photos of years past, and most importantly on how to join the party (here, there and/or everywhere), check out Le Dîner en Blanc’s website for more info.